Researchers at the Wellman Center for Photomedicine at Massachusetts General Hospital (MGH) have developed a one-micrometer-resolution version of the intravascular imaging technology optical coherence tomography (OCT) that can reveal cellular and subcellular features of coronary artery disease. 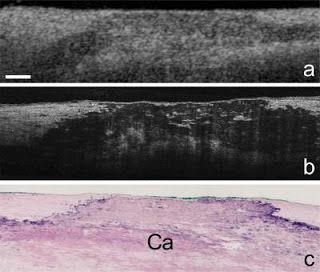 In a Nature Medicine paper receiving advance online publication, the investigators describe how microOCT – which provides 10 times greater resolution than standard OCT – was able to show individual arterial and inflammatory cells, including features that may identify vulnerable plaques, within coronary artery samples. "MicroOCT has the contrast and resolution required to investigate the cellular and subcellular components underlying coronary atherosclerosis, the disease that precipitates heart attack," says Gary Tearney, MD, PhD, of the Wellman Center and the MGH Pathology Department, who led the study. "This high level of performance opens up the future possibility of observing these microscopic features in human patients, which has implications for improving the understanding, diagnosis and therapeutic monitoring of coronary artery disease." A catheter-based technology, OCT uses reflected near-infrared light to create detailed images of the internal surfaces of blood vessels. Although the technology is already being used to identify arterial plaques that are likely to rupture, standard OCT can clearly image only structures larger than 10 micrometers (millionths of a meter). Using new types of lenses and advanced imaging components, microOCT is able to image structures as small as one micrometer, revealing in intact tissue the detailed information provided by the prepared tissue slides of traditional pathology much faster and in three dimensions. "When we are able to implement microOCT in humans – probably in three to five years – the 10 times greater resolution will allow us to observe cells in the coronary arteries of living patients," says Tearney, a professor of Pathology at Harvard Medical School. "The ability to track and follow cells in three dimensions could help us prove or disprove many theories about coronary artery disease and better understand how clots form on a microscopic level. Improved definitions of high-risk plaques will lead to greater accuracy in identifying those that may go on to rupture and block the coronary artery, and the ability to monitor healing around implanted devices like stents could reduce the number of patients who must be on anticlotting medications, which are expensive and have side effects."